Today was a momentous day. Today we closed on a house in Midland, Texas. Now, if you know anything about the housing market in Midland, you would know this is an enormous feat. But if you are not familiar with this area known as the Permian Basin, please let me fill you in. The rents here rival San Francisco’s, and it’s not because of the panoramic views of trash blowing along the highway or the smell of carbon emissions from the jacked up trucks clogging the roads. This flat and desert-like area in West Texas is in the midst of a huge oil boom, bringing workers in every day from places like Canada, Louisiana or in our case, Amelia Island, Florida. Our family’s road to home ownership in Midland was a rocky one. The first hurdle was to sell our home in Florida. When we first listed our home for sale in the early summer, I assumed the house would sell in about a week. According to our realtor, our house was priced to sell, and we agreed with her assessment. When we bought our family home in 2013—the first home my husband and I had ever purchased—Florida’s real estate market was still recovering from the Great Recession. The house had been sitting as a spec home for about a year and was within our modest budget. After being a seasoned student of real estate prices in my hometown of Austin, we jumped on the purchase price and were newly minted homeowners. The two-story, stucco home on Amelia Island sat in a quaint neighborhood of exactly three streets. The house with its porch and columns resembled a Craftsman style home with a Florida vibe. It was perfect for our then family of five—the updated kitchen opened up to the family room, which contained high ceilings and a sliding glass door to the patio and backyard. A separate living area greeted guests upon entry into the house, which later became a quiet spot to work, read a book on the couch or host a relative on the pull-out sofa. I jokingly referred to the front room as the “blue room,” with its soothing ocean-hued couch and abstract paintings decorating the walls. Our master bedroom was situated downstairs, while the three secondary bedrooms were upstairs with a loft in the middle, which served as an additional living room for the kids. (This play area usually bought us a little more sleep in the morning pre-twins). When we moved into the home, it was the summer of 2013, and our youngest had just turned one. We also had a two-year-old son and rising kindergartener. We were in the toddler/young children years, and my husband Alex was about to start a grueling sea tour in the Navy. My daughter attended her first day of kindergarten at the local elementary school as we were moving in, and we found a great Mother’s Day Out program for the boys. The pristine beach and local YMCA were a short bike ride away. After five years in the same spot, we knew most neighbors and celebrated various birthdays and some holidays together. When the twins were newborns, they pitched in to help with driving the older kids and walking them to and from the bus stop. Our extended families were thousands of miles away, but we had created our very own village in Florida. As we made the difficult decision for Alex to leave the submarine force after 12 years of service, I was torn between wanting to stay on Amelia Island or return home to Texas. He job hunted in both areas, as well as the Southeast, and I mentally prepared myself that the odds of staying on our little island were slim. On the occasional night out, filled with merriment and a little booze, I was fond of declaring, “I’m never leaving the island!” Many came to our little island for a slower way of life; few left it willingly. As the final months elapsed, we tackled some fun things on what I thought of as my Florida bucket list. Alex surprised me with a trip to swim with the manatees at Crystal River for my fortieth birthday, an excursion I had coveted before I ever lived in the Sunshine State. My daughter and I explored the (man-made) tropical paradise Discovery Cove to celebrate her tenth birthday and swam with a dolphin. We never did make it to the Food & Wine Festival at Epcot, the Florida Keys or the Weeki Wachee Springs State Park, which boasts live mermaid shows. When we decided on a job offer in Midland, and the “For Sale” sign went up in the yard, I remember thinking that one day, this would be the house that we “used to live in.” We would drive by and say to the children, “Look, we used to live there.” My present was about to become my past, and the thought made me sad and nostalgic. Change is hard and also reminds us that our time on earth is fleeting and impermanent. During my evening walks with the dogs, I would take in the dense trees, circling hawks, lizards scampering on the sidewalks and honking geese dining on the field behind our fence. I know now that Midland does have some trees and nature but Florida is exploding with natural beauty. When it was finally time to leave, our chaotic departure felt like a surreal break-up with little closure. A few days before vacating our home, we celebrated my son’s sixth birthday with my in-laws at their rented beach condo, and then the twins’ first birthday at our favorite Mexican restaurant where they always treated us like family. While the movers packed and loaded, we stayed at a VRBO property near the beach, where we walked on the shore for the last time. I wondered when I would walk on the beach again. I took in the constantly churning water, the soft sand, the thousands of little shells, the carefree feelings of my children. They had no idea what the future held. The innocence of children is perhaps a great coping mechanism. It is not their job to worry about moving logistics and real estate. They simply live in the moment, enjoying the experience only for what it’s worth. We barely had time to say goodbye to our friends, neighbors or church, where we were baptized as adults. And our house hadn’t sold yet. Alex reassured me, when a family looks at our home, they will make an offer. The current crop of retirees scheduling showings didn’t appreciate the stairs or proximity to schools, but we knew a family would. When we finally arrived in Midland after a very dramatic cross-country drive, involving an unexpected pit stop in New Orleans, we were fortunate to stay in a corporate rental, a new construction home in a booming neighborhood filled with young families following the smell of oil. Fast forward to today, and we have now spent four months in the temporary house about half the size of our old one. We are all sharing rooms, and most of our worldly possessions sit in storage. A family of five finally checked out our house in Florida, and they jumped on it. From the looks of their Facebook posts (I’m not stalking them, I swear! We have a friend in common, so I happened upon it in my Newsfeed), they look ecstatic in their photos, holding up a picture of their new home, the house we used to live in. And in the crazy real estate market they call Midland, we found a house of our own. After months of searching and losing out on listings, we were finally in a position to buy. As of today, we are the proud owners of a sprawling ranch style home in an established neighborhood with mature trees. In Florida, we took trees for granted; here, one is lucky to own a single tree; the newer neighborhoods boast beds of multi-colored pebbles. Walking through our new home over the past month to figure out tile backsplash and paint colors, I felt a sense of excitement and hope as I watched my now young toddlers walk briskly in circles around the house and shut themselves into bedrooms. The bigger kids excitedly picked out their new bedrooms and weighed in on wall colors. I noticed the Halloween and then Thanksgiving and now Christmas decorations adorning our future neighbors’ front lawns. Baby swings suspended from tree limbs dot the street. I miss our curated village and house on Amelia Island. And I hope our old neighbors let us tag along to the annual Food & Wine Festival next year (hint, hint). But I’m ready to turn the Midland house into the home we live in. Shop all Gymboree sale here. Pair with skinnies and booties (or sneakers) for an easy fall look. This tiered long sleeve tee by Caslon is on sale for $23! Comes in a variety of colors. Shop Nordstrom Fall Clearance here. Cozy up by your glowing fireplace all day long with this Red and White Snowflake Sweater Throw! You will love the woven texture of this lovely blanket. Turn any water play area into the perfect space for creative building! Do some good while you shop this holiday season. Click banner for link. This website serves a lot of purposes these days… At least that is my goal as I tend to it again after a 9-month hiatus. In my first post back in 2013, I noted that my intent was to provide myself and other women in the throws of motherhood a place to slow down, share, and relish in the good, bad, and ugly of life while raising little humans. Since that year, I have birthed another two children and now see the light at the end of the tunnel on my 4th and final pregnancy 🙌. I have learned a lot, forgotten a lot (ha! ), lived a lot, and evolved in so many ways. I now want to reconnect with other mothers, women, and parents who want to join me in celebrating this Little World Life. 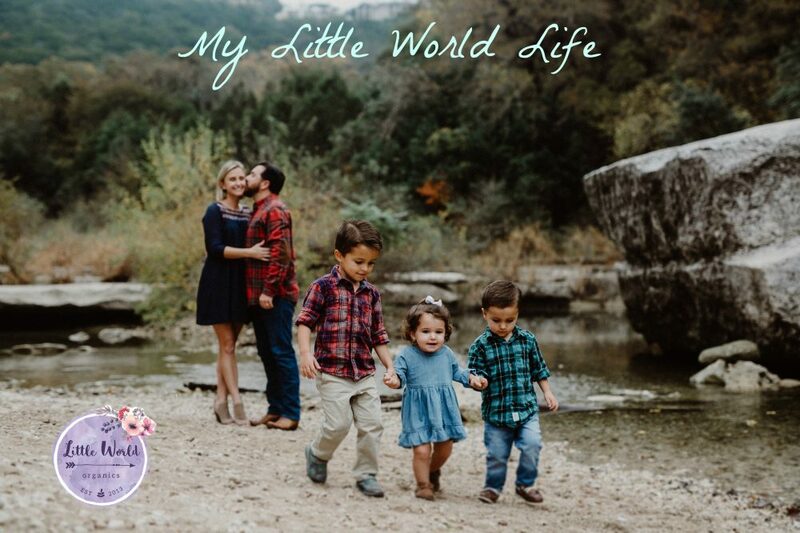 My website is still Little World Organics, of course, but what this site is really about is the life that I live and breathe every day while managing (or attempting to manage) what will soon be FOUR young children. Did I mention that my oldest is only five years old?!? The second original purpose of my blog was to spread the word about Holle, HiPP, and Lebenswert organic infant formulas. When I first launched this site, these brands were almost unheard of in the States. The only place you could easily buy European infant formula at the time was Ebay, which frankly scared the heck out of me. I knew there were other parents who felt the same uneasiness that I felt ordering formula from random sellers online, and that is what motivated me to start this blog. This perpetually evolving journey has come full circle now, and I am hopeful that I can maintain my online store, which is the actual vehicle for selling the formula, and my blog, which is my behind the scenes platform to connect with customers, new moms, veteran moms, and other like-minded humans. I can’t wait to see what the future holds for My Little World Life! I hope you stick around for the ride… It is bound to be a wild one! Punxsatawney Phil did not see his shadow last month, so Groundhog Day left us with a prediction of an early spring. For some, the end of winter means putting up the snow blower, downgrading from a down jacket to a fleece and not worrying about the next blizzard. For others, it simply means we can put our cardigans back in the bottom drawer, and stop wearing socks with our flip-flops. Spring is a time of rebirth, reawakening and … vacation! March is here, and in a few weeks, students will start the time-honored tradition of Spring Break, their week of freedom from school. Spring Break can be a source of excitement for children, or utter dread for parents. Many parents do not have the luxury to take a week off from work and other commitments to plan a get-away for their brood. For those lucky enough to have the time and resources to get away, here are some ideas for places to maximize your family fun. For many, the thought of air travel, with its bag restrictions, weather delays and scaled back services, is not an appealing option. Throw in a couple of impatient, pint-size travelers, and a one-stop flight can turn into a never-ending nightmare. Gas prices are super low, but some parents cringe at the idea of road-tripping it with babies or toddlers. Hazards of road travel include frequent chants of “Are we there yet?”, bathroom stops every twenty minutes, and occasional projectile vomiting from carsickness. (If you go down this road, I strongly recommend Dramimine for Kids, which conveniently induces sleep while preventing nausea). A staycation is the ideal solution for parents who don’t want to mess with the headaches of traveling. Yes, you will still have to pack your bags, but if you forget something, you can just run back home. Do you live in a city with a kid-friendly hotel, or one that offers roomy suites and a nice pool, or proximity to local attractions? I reside in a touristy town, so we are fortunate to be down the road from two acclaimed beachfront resorts, but you don’t have to live near the coast for a cool hotel stay. For those in Austin, three resorts jumped out at me as the ultimate family destination: the Hyatt Regency Lost Pines Resort and Spa, the Omni Barton Creek Resort & Spa, and Lakeway Resort and Spa. Each of these resorts offers amenities such as kids’ camps, kid-dedicated pool areas and recreation schedules for the whole family to enjoy. Not to mention, the “Spa” part—relax with a massage while your mini-me is hiking through the beautiful hill country with her new friends. Just remember the sunscreen and bug spray! For those closer to San Antonio, the Hyatt Regency Hill Country Resort and Spa boasts a lazy river, five-acre water park and pools, poolside cabanas for protection from the sun, and a zero-entry wading pool for the littlest water babies. From this sprawling property, you can easily eat and drink your way around the San Antonio River Walk, remember the Alamo, shop at El Mercado, go spelunking at Natural Bridge Caverns, explore the historic Spanish colonial missions or seek cultural enrichment at the Witte Museum, in addition to the city’s various theme parks. I grew up in San Antonio and remember field trips to many of these attractions, which I took for granted at the time. One day I hope to take my kids to this city filled with Texas history and rich culture. Even if you don’t live close to a resort with all the amenities, look for a hotel that offers options like family-friendly suites, free breakfast and an inviting pool. Kids are easily entertained and don’t need an 18-hole golf course. Poolside food and drink service is a plus! Many of us don’t have the funds set aside to stay at a fancy resort. You don’t have to check in to a hotel to live up your (kids’) Spring Break to the fullest. Get together with your offspring, and make a list of activities in your area you would like to do together. Seek input from the smallest to the eldest children. You can designate each day, or morning, for a particular outing. Many museums offer a free day of admission each week to the public; you may want to use that day to check it out for free, or if fewer crowds are important, go during an off-peak time. Google searches now allow you to view the “popular times” of particular venues to determine crowd levels. Some ideas for daily excursions include: a picnic at the neighborhood park, trips to the zoo or aquarium, an easy hike at a nature preserve with trails, a visit to a children’s museum, an art museum with a kid-friendly section, a museum of natural history, a low-profile sporting event (ex: high school baseball game, local soccer match), volunteering at a lake or beach cleanup or soup kitchen, going to a scenic location in your city with sketch pads, and colored pencils or water colors, and drawing or painting what you see. Many of these activities obviously depend on your children’s ages. I have discovered that the older my children get, the more complex the activities can be. With a baby or toddler, you need to respect their feeding and sleeping schedules, and work around those times with easy, no fuss outings. A walk around the block with a months-old baby can be considered a successful outing when the new mother has been cooped up in the house for days. Many days I dream of an all-inclusive vacation near a sandy beach and turquoise waters where my children are whisked away to an enriching kids’ club. The hubby and I will lounge by the pool, drink piña coladas and snorkel. I have spent countless hours researching this dream trip, and the destination that checks all the boxes is Beaches Turks & Caicos. The price tag is enormous, especially for a suite, as my husband and I require separation from our children in the evening hours. I put this resort on my bucket list, and until then, I will dream of basking in the glowing sun with bottomless drinks. Another promising destination is the Franklyn D. Resort in Jamaica. This property caught my eye on TripAdvisor one day when I read glowing reviews of its nanny service(!). Each family is paired with a nanny to care for the children during the day so the parents can enjoy their time together. These nannies come with the all-inclusive package and also act as your personal assistant and refrigerator stocker. I’m all for quality family time, but I’m sure the kiddos would have a blast with their nanny playing on the beach in the Caribbean. I wouldn’t feel an ounce of guilt. We live in Florida, so naturally every week someone’s Facebook post includes pictures from their latest trip to Disney World. We have braved Disney World twice, once staying at the budget-friendly and fun themed Disney property, the Art of Animation Resort, and the other time staying “off-property” (some Disney fans shudder at this word.) Disney World is a lot like childbirth. I forget how painful it is, and then I decide to give it another shot. A glutton for punishment, I have considered visiting the land of Mickey Mouse this spring. If I do take the plunge, I have my eye on Disney’s Old Key West Resort. The suites are large, the property is older and less hectic than the other resorts, and you can take a boat ride to Disney Springs (formerly known as Downtown Disney). Besides Disney World, Orlando has a ton of appealing attractions such as Universal Studios, Discovery Cove, Legoland and Gatorland. I personally would not visit Disney World during Spring Break but would instead opt to pull the kids out of school in late April, as waiting in lines for hours with thousands of people is not my idea of a fun vacation. If you live near a departure port, like Galveston or Miami, a cruise could be an excellent option for a family vacation. There are many different price points, types of cruises and destinations offered. I have heard from many experienced cruisers that Disney Cruise Line is top notch. Carnival has caught my eye in the past because they offer a kids’ club to ages three and up, which would suit my family’s needs, and appear budget-friendly, though the extras can quickly add up. This is the option that I know the least about, because we have yet to take our children camping. We live near a beautiful state park, where you can rent a spot and plop down your camper or tent. Personally the camping that calls to me includes cabins and running water, or its modern spin-off, “glamping.” There is something appealing about hearing the crickets at night, roasting s’mores over a blazing campfire and bonding in the simple pleasures of nature. For those in need of nearby civilization and fake characters, I have heard rave reviews about Disney’s Fort Wilderness Resort, a campground property within the Magic Kingdom (with posh cabins or basic campsite set-ups), as well as Yogi Bear’s Jellystone Park Camp-Resorts. These options cater to families with outdoor amenities and cuddly characters like Chip ‘n’ Dale hanging around the campfire. We plan to go camping in the future with our three young children, and I will report back with my observations. And the final option, which is appealing in its own right, is a Spring Break camp for kids. It’s a safe bet that your city contains multiple options for your children, whether through their after-school programs, the YMCA, the local kid-friendly museums or sports, to name a few. If you can’t take time off or swing a family vacation, or would rather enjoy your quiet time at home spring cleaning or watching HGTV, sign your kids up for a camp. They will come home worn out each day, and you can rest easy knowing that they are making happy memories during their time off without breaking the bank or your sanity. Aimee Tafreshi is a mother of three young children and former litigator who has also contributed to Nameberry.com, Fé Fit and her own blog, aimeetafreshi.com. She has no affiliation with any of the hotel properties mentioned in this blog, other than being in desperate need of a vacation. For how not to do Disney, check out her recounting of a disastrous trip here. In case you hadn’t seen all the ads on TV for cheap gym memberships and weight loss plans, January is here! Society commands us to start fresh and emerge from our holiday cocoon as new and improved human beings. All of a sudden, we need to morph into fit and healthy goddesses with shiny hair and a fat wallet. It’s time to become perfect, people. This is the time of year that I least enjoy the gym because all of the machines are taken like coveted parking spots, and the group exercise classes only have room against the back wall. I know that by March, much of the New Year’s crowd will have dissipated. Even though I fashion myself as a writer, I don’t usually jot down any New Year’s resolutions. Instead, I keep a mental list in my head of things I would like to accomplish or improve upon. (This is smart because there is no accountability.) This year’s aspirations are a little different than past years, but I think these goals might have tangible benefits. For starters, I resolve to not work out. This is a difficult resolution for a Zumba instructor and Les Mills devotee. I have not hit the gym since I broke my foot last month, and it is nearly torture. On the advice of my doctor, I tried swimming laps with my bum foot and ended up needing a hospital visit as a result. So while images of celebrity “beach bodies” and “biggest losers” taunt me off the pages of my beloved gossip magazines, I must feel content to accept my slightly tighter jeans and softening abs. My “no exercise” plan goes hand-in-hand with my next resolution: eat real food. I’m not going to start counting calories, go on a liquid diet or pop pill supplements, but I am going to eat less processed foods, like fruits, vegetables and whole grains. I am not a “veggie person,” but I figure if I start treating food like the fuel that is necessary to power my body, then perhaps these nutrients can expedite the healing of my foot. Revolutionary, right?! I will also savor a glass of my favorite red wine in the evening, but I will try to stop with glass number one. I will allow the calming effects of a glass of vino to set in before reaching for glass number two and incurring a headache. Antioxidants are healthy; overindulging is not. My bum foot has taught me, rather forced me, to slow down. I currently move at the pace of a geriatric turtle. Needless to say we have trimmed our list of obligations, and now we are driving to activities merely twice a week, a marked improvement. We have culled down the list of “must do’s” to the endeavors our children truly enjoy. This reduction in obligations is part of my resolution to simplify, streamline and purge unnecessary items, distractions and “enrichment” activities. We also have a garage full of overflowing bins of baby clothes and various things collected over the last few decades. I plan to slowly chip away at getting rid of every extraneous item that we don’t need or use, with the plan to consign or donate these obsolete possessions. Related to slowing down, I resolve to sit on the couch and watch TV. You would think a stay-at-home mother watches a ton of television, but I rarely do. Sometimes you just gotta kick your feet up for thirty minutes, put on your favorite home improvement show or true crime story and veg out. I vow to take more advantage of my kid-free, down time because goodness knows there is no relaxing once the three little ones are at home. Speaking of kid-freedom, I vow to kick “mommy guilt” to the curb. I think most of us moms feel guilty about something from time to time, if not everyday, with respect to our children and our choices. My sons recently transitioned to a full-time schedule at their preschool to permit me more time to sit and heal, since my husband is seldom home due to work. Do I ever feel guilty that they are at day care, and I am not heading to an office to help pay for this added expense? Yes. Do I feel guilty that they are now at school from morning until evening without seeing their Mommy? Yes, I do. But I also realize that the quicker my foot heals, the sooner I will be able to go on walks and bike rides with them and kick the soccer ball on the field. I resolve to trade short-term guilt for long-term rewards. And when the children are at home in my care, I resolve to set the phone down, turn the laptop off and focus on those little human beings. I resolve to take in their faces, their voices, their silly comments and even their bickering. Social media and online distractions will always be there, but my children won’t. One day they will stare at their phones tuning me out. I better pay attention to them now while they are still talking to me. I resolve to have more patience with others and myself. The house will not look super organized while I am using crutches, and if papers stack up, the world will not end. I will feel more in tune with others in need and ask myself if the elderly person in the grocery store needs help reaching an item but is too proud to ask. Because once you’ve had some of your physical independence removed, it makes you think about others who are even less mobile and able. On the professional front, I resolve to finish writing a legal thriller that has been outlined and sitting in a drawer since 2004. Whatever your goal is, you have to carve out the time and make yourself do it. I have a silly saying that I tell myself: Stop, drop and write. It means stop doing anything else, stop making excuses, and drop into your desk chair and write. It’s simple but the mantra works. Whatever your goal is in 2016, in the words of Nike, JUST DO IT. Okay, I said I wouldn’t exercise but I lied. I’m going to try to find a new way to exercise that doesn’t put weight on my foot. I’m going to follow in the footsteps of warriors who take a hit but get up and keep on fighting. If I can’t use my foot, then I will use an exercise band and small weights to keep in shape. But if I get tired or if the movement hurts, I will stop and rest. We all need to listen to our bodies and common sense. I will seek out an adventure that I can do, like kayaking on a weekend. We humans have things that limit us in our lives, whether physical, temporal, monetary or something else. But we can seek to work with what we do have and open up an undiscovered world of possibilities. Here’s to challenging yourself in 2016. Aimee Tafreshi is a mother of three young children and former litigator who has also contributed to Nameberry.com, Fé Fit and her own blog, aimeetafreshi.com. If you would like to help Aimee get her legal thriller published, please vote for it here. Proudly powered by WordPress Theme: Babylog.